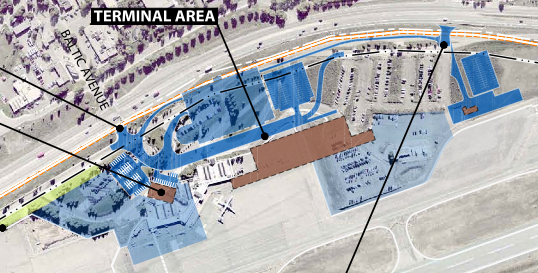 A detail from the 2012 Aspen airport master plan. The area in brown is the site of a new terminal. Design guidelines are being developed for new buildings and facilities at the airport. In anticipation of a new terminal building and a second fixed-based operator coming to the Aspen/Pitkin County Airport, the Pitkin County commissioners on Tuesday supported the creation of a task force to draft design and construction guidelines for all future development at the facility. The commissioners approved an airport master plan in December that included up to 80,000 square feet of space for a new airport terminal building. The master plan also included defining space across the runway from the terminal for a second private-plane fueling and servicing station, commonly called a fixed-based operations (FBO) facility. The airport has already awarded a planning contract for $189,350 to Tim Malloy of TG Malloy LLC to develop design and construction guidelines, and on Tuesday the commissioners signed off on the process and the proposed members of the task force. Malloy told the commissioners Tuesday that other firms involved in the project include the landscape design and planning firm Bluegreen of Aspen and Jviation, a Denver-based airport planning firm. Also on the project team is Charles Cunniffe Architects of Aspen. As part of the development of the design guidelines, the airport’s planners will also review “best practices” for ground transportation to and from airports such as Aspen’s, which is 3 miles from downtown. Airport Director Jim Elwood said the design guidelines should help alleviate anxiety in the community that the airport might “get carried away” with a new terminal and do something “out of scale” with the community. “This will help keep us grounded in the community’s values,” Elwood said. The resulting design guidelines document is expected to be fairly technical in nature, Malloy said Tuesday. It will include guidelines for architecture, site improvements such as exterior lighting and landscaping, construction management, the project-review process, and how improvements at the airport relate to other local planning documents such as the Aspen Area Community Plan and the West of Maroon Plan now in development by the county’s Planning and Zoning Commission. The members of design guidelines task force are to include Jeff Yusem of the nearby West Buttermilk neighborhood, John McBride of the Airport Business Center across Highway 82 from the airport, Jackie Francis of the North 40 neighborhood next to the ABC, and Meg Haynes of the Starwood neighborhood, which overlooks the airport. It also includes Fred Mosher, the director of the existing FBO at the airport run by Atlantic Aviation; Dave Corbin, the vice president of planning and development for Aspen Skiing Co.; local architects John Galambos and Scott Lindenau; planner Leslie Lamont; and Pitkin County P&Z member John Howard. Commissioner Rachel Richards suggested the task force also include representatives from the city of Aspen and town of Snowmass Village, as well as a representative from either the Aspen Chamber Resort Association or Stay Aspen Snowmass. Malloy, the planner leading the project, said there will also be in-depth interviews with the task force members, as well as with airport employees. The expected six monthly meetings of the task force are to be open to the public. The county commissioners are expected to attend the first task force meeting and perhaps the fourth meeting, after initial guidelines have been defined, Malloy said. The guidelines will then be presented to the commissioners for formal adoption in a standard process that will require a public hearing. The guidelines are not expected to be incorporated into the county’s land use code, Malloy said, but would be a guiding document for any future development at the airport. The commissioners on Tuesday also supported a new study to determine what type of regional jets are most likely to fly into Aspen in the future and what changes might be required to accommodate them. Some of the new jets may have wing spans that are over the airport’s current restriction on wing spans over 95 feet. Editor’s note: Aspen Journalism and the Aspen Daily News are collaborating on coverage of issues related to land, water and wealth in Pitkin County. A version of this story was published in the Daily News on Wednesday, June 19, 2013.